When the ‘Enter the System; Kimura” Danaher DVD came out last month I thought it was a great way for everyone’s favorite coach to round off a very productive year. Not surprisingly, I was wrong. Just when I thought Danaher was all done for 2018, he announced the release of the fifth John Danaher instructional DVD. Another one in the Enter The System series, of course, and one on a subject that nobody can ignore – triangle chokes. AS far as Christmas presents go, this is the ultimate option. Danaher just made Christmas easy for all the families and significant others of grapplers worldwide! 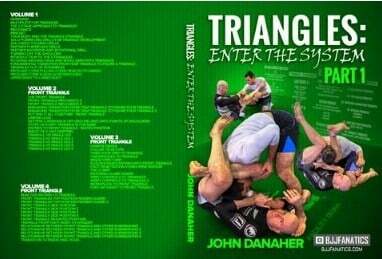 Enter The System: Triangle is the latest in an installment of John Danaher DVD instructionals that keep changing the landscape of Jiu-Jitsu. Many people thought that the inaugural leg lock DVD was all that Danaher would produce. Although it took a while, he got a second hit out as well – the back take series. From there on things sped up, and the Front Headlock, and just recently, the Kimura DVDs also “hit the shelves”. Now, Danaher makes it a perfect five, adding an integral part to his ever-growing BJJ DVD collection. And, of course, we’re all psyched about the contents! After all, Renzo’s black belt already proved he know just as much if not more, about every part of BJJ as he does about breaking legs. If you take a look at BJJ Academy logos, T-shirts and similar designs, you’re bound to recognize an obvious common thread. The shape of a triangle features very heavily in a large portion of BJJ logos. Regardless of affiliations, or the preference to train in a Gi or without it, the triangle is as much a symbol of BJ Jas the Shaka sign is. The reasons for such extensive use of triangles are simple – they work. Not just that, but they work from the bottom, which is where BJJ brought the most innovation in the world of martial arts. The triangle choke is one of the most potent weapons that Brazilian Jiu-JItsu has to offer. It’s been around from day one and has proven to be effective in all avenues of combat. From sports BJJ to self-defense and even MMA, the triangle is a highly reliable technique. As it is customary with the highest percentage Jiu-Jitsu moves, the triangle has undergone quite an evolution. Today, there are plenty of variation fo the strangle, all offering a high degree of effectiveness. It is no wonder that Danaher puts so much emphasis on them. They fit perfectly into his philosophy of systems and subsystems. For example, this last Danaher DVD is all about the triangle choke as a complete system. It features positions, entries, mechanics, follow-ups, and connections to all other submission systems he has. Furthermore, they are divided into subsystems, based on the different variations of triangles. All in all, the triangle choke is about to get a complete rehaul and it’s going to be available before the year ends! What’s there left to say about a John Danaher DVD. By now, it is clear what we can expect. Over 10 hours of material is a given by now, so there’s nothing surprising about that. Once again, a two-part series, featuring 4 volumes each seems to be the norm. Still, every new Danaher DVD brings about an interesting innovative feature. So far, we know not to expect to see a single triangle choke by as far as the third volume. The introduction to mechanics and the complete deconstruction of the move takes precedence in the first couple of volumes. Believe me, when I tell, you, even if you are a triangle wizard, you’re going to have things to re-learn about this fundamental submission. John Danaher spends a long time exploring what makes a triangle work. Even more importantly, he outlines what makes a triangle fail, and how to overcome the most common mistakes. The real magic happens later on, as expected. Well, not quite as expected. I don’t know about you, but I certainly didn’t anticipate a 51-year-old Danaher with a hip and knee replacement executing flying triangles like he was doing nothing special. And that’s just the tip of the triangle (pun intended). What I loved about this Danaher DVD is that it has the “classroom commentary” feature we first saw in the Kimura is back. Having Danaher go over everything he teaches, as things take place live during rolls is irreplaceable when it comes to understanding the system. Danaher’s introduction to his triangle system is once again, a masterpiece. To be honest, Danaher is not a white belt coach – or at least his DVDs are not. While he dumbs down everything in terms of mechanics and application, he takes it for granted that people know certain BJJ specific movements by heart. That said, I find him as more of an advanced student/black belt level coach. His takes on fundamentals like the triangle choke or the Kimura are truly game-changing. He has a unique understanding of Jiu-Jitsu and an even more unique capability of teaching it. Learning the fundamentals from a completely different perspective is exactly what turns “regular’ grapplers into world champions. Well, it seems we got more than we expected. With Danaher, you kind of never know what exactly you can expect, but still, this Dnahaer DVD is beyond everyone’s wildest dreams. The triangle as a staple of BJJ had a lot of people fooled that they know and understand it. Well, Danaher provided the wake-up call, as usual. His triangle system is literally for everyone. GIven that triangles are legitimate submissions at all levels, there are no “legal” obstacles. Next up, Danaher dispells the myth that people with shorter limbs can’t efficiently do triangle chokes. On the contrary, his system provides options for people of al shapes and sizes. All in all, this DVD deliver the ultimate triangle system that everyone can execute with precision. As usual, 8 volumes make up the instructional, each dedicated to very specific aspects of the triangle game. Once again, a perfect product with nothing negative of note. The opening volume of this Danaher DVD, as usual, starts with a lot of theory. There’s no way you can follow Danaher along, later on, if you do not really grasp what’s he’s talking about in volume one. Make sure you thoroughly watch this one before you move on. Danaher first goes into what triangles mean, instead of going over technical aspects. He shares his multiplicity theory first, before offering an insight into his approach to triangles. Whatever you were doing before, you can freely forget. All you need is to follow the two stages to triangle chokes that Danaher outlines. There is also a very good chapter on the mindest of triangle hunting and how to open your mind to triangle setups. In terms of mechanics, you probably won’t find a better explanation of triangle chokes anywhere. Danaher not only explains how a triangle works as a submission and position but also the relationship between your body and the triangle. As with other Enter the System DVDs, Danaher then heads to demonstrate the best solo and partner drills you can do. The final third of the DVD move son from drills to explaining the triangle variations covered in this Danaher DVD. There are 5 in total in his system, featuring the front, side, rear, reverse and opposite triangle. Each of them has its dedicated space later on in the series. Before finishing the first volume, Danaher goes over some common triangle situations and whether they have a place in the system or not. Pulling on the head is one example. The front triangle takes centerpiece in this Danaher DVD. It is the “standard” triangle we all learn as early as a white belt. In this instructional, the front triangle stretches to three whole volumes and over 4 hours of material. The names of the transitions and techniques are again unique, but completely appropriate and understandable. John’s nomenclature is in fact largely responsible for the “light bulb moments” we all have while watching his material. This instructional is the same. First and foremost, the definition of the front triangle and a few chapters dedicated t deconstructing the mechanics. Sufficient to say, you’ll finally understand how the triangle works, and most importantly, why it works. He also puts heavy emphasis on the so-called “trap triangle” that precedes almost all of Danaher’s triangle strangle setups. Danaher goes over a few triangle traps to triangle strangle transitions before putting it all together to finalize the submission. Now that the concept is complete, you get to put it to use. It all starts with the unified legs theory, which paves the way for lower back positioning during the strangle. Finally, John starts with the first of many triangle choke entries with a sitting guard 2-on-1 setup preceding a whole series of entries against a single leg takedown attempt. 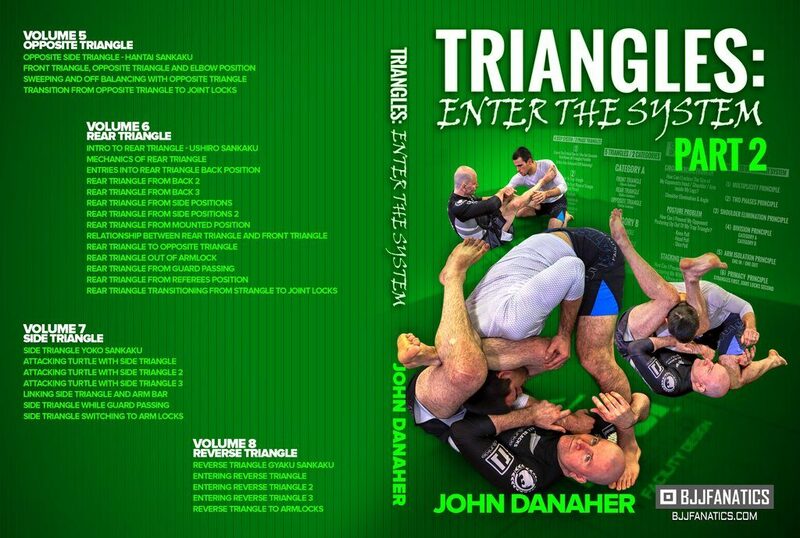 The third volume of “Enter the System: Triangles” John Danaher DVD picks up where the previous one left off. This volume, as well as the next one, is all about entries to the front triangle. Some are usual, some are unusual, yet all make perfect sense, thanks to Danaher’s teaching style. Here, another staple of Danaher’s gripping system comes to the forefront – the overtie. The first few chapters address the front triangle from an overtie / overhook setup. Since the overtie works closely with the collar tie, there are options for alternating the two to get a triangle. One of Danaher’sfavoritee principles from the bottom is Kuzushi, borrowed from Judo. He uses it heavily to set up leg locks, and now also comes in handy for triangle setups. He has several options here, featuring the efficient clamp guard as a starting point. In terms of grips, Danaher’s also covers a few wrist control combinations that open up front triangle setups. A cool monoplata entry to the front triangle wraps this volume up, but it is far from the last front triangle entry in this Danaher DVD. The first two volumes dedicated to the front triangle covered the essential mechanics, miscellaneous specific details as well as attacking entries. The final volume that covers the front triangle starts with a very cool option – reactive entries. Catching someone in a triangle when they initiate the action is one of the best things about the triangle choke. And, given the mechanics of the choke, there are plenty of options to do so. After the reactive entries intro, top position takes precedent. Here, Danaher begins from guard passing situations. He offers a few different triangle entries from different guard passing scenarios. Immediately after is the side control to front triangle series, which takes up most of this fourth volume. In fact, there are half a dozen different ways in which controlling the side mount can open up front triangle chokes. All entries tie together in a neat little subsystem, and all have a very high degree of success. After the side mount, natural progression takes Danaher to the mount, and all the triangle strangle options it offers. The mounted triangle is one of my favorite options from the position, so I really appreciated every ounce of Danaher wisdom in this chapter. Wrapping things up is a really cool portion that goes over the relationship that front triangles have with other submissions. Some of the techniques featured here are “standard” triangle follow-ups, like Omoplatas, and armbars. However, there’s also a transition into heel hooks that are real eye-openers. This was an illuminating volume of this John Danaher DVD, to say the least! Only on a few occasions before this, I had the opportunity to work on this position, but never truly in depth. Having nobody to really dissect it had a lot to do with it if I’m being honest. Of course, it all starts with a Japanese name – the Hantai Senkaku. It is a Danaher DVD after all. Nomenclature aside, Danaher really sheds light here on a position that’s not used in BJJ too often. The nearest position to the opposite triangle is your “standard” front triangle. Normally, Danaher explores their relationship first, offering a way to transition between the two without losing control. This last part with the control is essential, and it all comes down to what you do with the opponent’s elbow. The elbow positioning really changes the dynamics here, transforming the opposite triangle into a very useful attacking position. Some of the attacks here include sweeps, but not before you learn how to integrate the Kuzushi principle once again. As it seems, the opposite triangle makes this really easy, due to its dominant mechanics. It wouldn’t be a true Danaher DVD if there weren’t submissions flying left and right, would it? Well, they’re not exactly flying from the opposite triangle but they are plentiful. While choking directly from the position is not possible, joint locks, like Kimuras, and Americans are right there for the taking. You’ll fall in love with this one straight away, no doubt about that! The rеar triangle is another one of my bread and butter techniques, so I was really stoked about this volume of the DVD. It took real self-restraint no to watch this first, but certainly paid off! After a typical Danaher intro, going over the position and dissecting mechanics, Danaher transitions straight into entries. Entries from the back kick things off, as it is one of Danaher’s favorite ways of getting to the rear triangle. A word of advice here – use the information from this volume of the Danaher DVD in conjunction with the back attacks DVD, particularly the auxiliary subsystems. It makes everything crystal clear. It turns out the back is not the only position that opens up rear triangle attacks. Side control does the trick also. In fact, there are multiple entries that all work like a charm. The surprise contender here was the mount, which was a huge “light bulb moment” for me. What I really love about Danaher’s BJJ instructionals is the interconnectivity of everything he demonstrates. All his moves tie in perfectly into each other without ever having to give up on something and start all over. Here, Dnahaer connects the rear triangle to the front, and consequently, the opposite triangle subsystems. As the volume draws to a close, it is rear triangle bonanza! There are entries from guard passing, other submissions, the wrestling referee’s position, and finally, options to get joint locks off the rear triangle. The side triangle concept is another groundbreaking one. It is not something new, but it does go much further than anyone has gone before with it. The Yoko Sankaku, as Danaher calls it, is a very, very useful submission to have in a lot of situations, While it is great as a submission on its own, it is also an unbelievable way to make sure you finish a failed front triangle attempt in certain situations. Right after the basic mechanics and overview of the position, Danaher goes into some slick entries, which start with the turtle. HItting a triangle strangle straight from the turtle is a great way to finish a match quickly. Breaking down a turtled opponent can be quite the hassle, so these entries are going to provide you with additional options. There is also a setup that stems from a guard pass, and it is one of the best entries you’ll see in this John Danaher DVD. Danaher also covers the link between the side triangle and some neighboring submissions. Namely, this triangle variation allows you to hunt, and change between, armbars and armlocks to multiply the threat. The final volume of Danaher’s fifth member of the Enter The System series is all about the reverse AKA inverted triangle. This triangle differs from the others in many aspects. First and foremost, it has a slightly, but significantly different mechanics that you have to understand if you’re to have success with it. Danaher, of course, boils it down to bare essentials, making it seem very simple. Furthermore, it offers a lot of possibilities since you can set it up even from inferior positions, like bottom side control, for example. The fact that it works as a surprise attack or counterattack, paired with the possibility to connect it with other triangles makes the reverse triangle a very potent weapon to have. This final volume starts with the mandatory theory behind the inner workings of the position. I cannot overstate the importance of this first chapter. The reverse triangle, as we said, can be really tricky so make sure you get every detail right before exploring the entries. Speaking of entries, this final volume has a whole bunch of them. Not surprisingly they feature both entries from dominant, as well as inferior positions. It is the real proverbial cherry on top of our triangle cake here. Notwanderingn far from his philosophy, Danaher finalizes everything with a very tight armlock followup from the reverse triangle. If you’re into triangles this is simply something you must have. It will probably change a lot of people views on the triangle and make you 1000% more effective. YES, it’s that simple! The only problem of DVD is with money just like with all other Danaher DVD’s but it’s hard to say it’s not worth it. I think it’s well worth the money they look for this masterpiece. Anyway if you’re not that capable of paying at the moment make sure you join our mail list at the top of the page when you join and we’ll provide you with the first big discount for all BJJ FANATICS products.